In the West, it is possible to have greens all winter, even in the mountains. I gardened for a long time in Colorado and was pleased to have fresh greens even in January. There are a few tricks to this, but first, let me say, I have not gardened in the NE, but I recommend Eliot Coleman's book Winter Gardening for those who live there. There are three factors when gardening overwinter. One is temperature, two is sunlight, and three is moisture. Plants cease to grow when temperatures are below 40 degrees Fahrenheit. In most of the West, daytime temperatures, even in winter, are above this, but the factor that is worst in a grow box or a greenhouse in the West is that temperatures, even in winter will get too high, not too low. In the West, with the exception of some of CA, OR and WA, BC and AK there is no problem with sunlight, but lack of sun (4 hours a day) will halt plant growth. The trick to low temperatures and low light is to grow your plants large enough so that they are held in REFRIGERATION all winter, grow when conditions are right, but are large enough by Hallowe'en that you can take some of the leaves and not strip the plant. If you have snowfall or grow in boxes, but for much of the west, moisture is a real problem, especially in places with wind. Be aware of this and go ahead and water by hand even if the water freezes later. But I have been able to harvest greens even in dry, frozen soils as long as I left enough leaves on the plant so that it did not suffer when asked to grow again. Of course, you can strip the plant and kill it or take it up when you want to eat it. In the Northwest, be sure to space plants wide enough apart to keep down disease and mold caused by crowding in wet conditions. Even if you do not have a garden, you can eat well if you grow in pots outside, or even if you have a good market. But this article is about winter greens. In winter, lettuce prices vary quite a bit depending on weather conditions in California. If you grow your own lettuce, you can be free of what is happening to the Imperial Valley. There are many, many lettuces that do well, even when it is below freezing. This is a picture of "Winter Density" one of the romaine lettuces that does very well overwinter. Seed catalogs should tell you if a lettuce is good in winter; most are, but some take frost better than others. A good place to hunt up lettuces for winter is "Cook's Garden." In winter, the brassicas are queens of the garden. 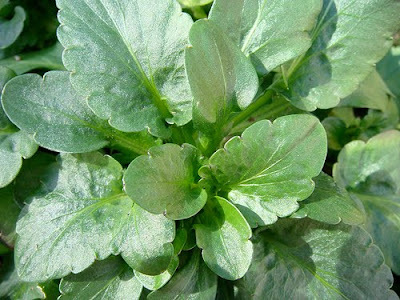 All of the Asian crucifers such as Tatsoi here are meant to be planted in late summer or early autumn and harvested all winter. You will find that most mustards and kales are much milder in winter than when grown in spring. The list of crucifers is very long, and I won't go into here here. There are only a couple of things to be aware of. First off, crucifers will depress the thyroid. To compensate for this, eat seaweed. Even kelp salt or dulse flakes will give you enough iodine to compensate for a depressed thyroid. Although crucifers have a lot of vitamin K, they will also thin the blood, which can be a good or bad thing, but be aware of it. They are also extremely high in Vitamin A. Crucifers also vary as to how much mustard taste they have. I find raw broccoli too strong for my tastes, but mild kales and Asian mustards are easy to eat when mixed with other greens. Crucifers need alkaline soil, so if you have sour soil, be sure to give them calcium or some other mineral like gypsum to compensate. Also try the leaves of broccoli like Spigarello or radish leaves for a change. Other biennials like spinach, chard and beet greens are also better in winter. Eating them raw helps with the oxalic acid, but if you are sensitive to oxalic acid, be aware that many greens have it, even kale, not just spinach. 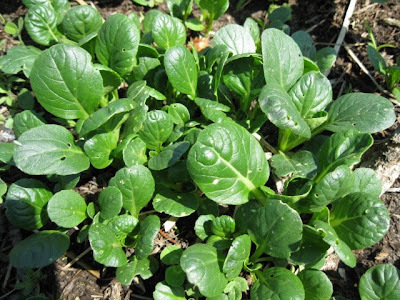 Better than growing spinach are the perennial goosefoots like Good King Henry or this perpetual spinach. They are hardier and will keep giving good greens well into spring. Spinach is one of the only seeds that will sprout at low temperatures. 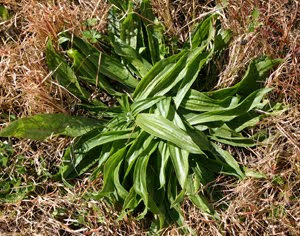 A common weed to enjoy in winter is plantain. There are many different kinds, even Italian ones with huge leaves like chard. They are extremely healthy to eat, but some are a bit tough, so you must cut them up very fine. They are mild and grow, well, like weeds. They are also much better in winter than in late spring or summer. I like to walk past people's lawns and look at all the weeds that I know are good to eat. It is a joke on Americans that they spend so much money digging up these goodies only to throw them out. 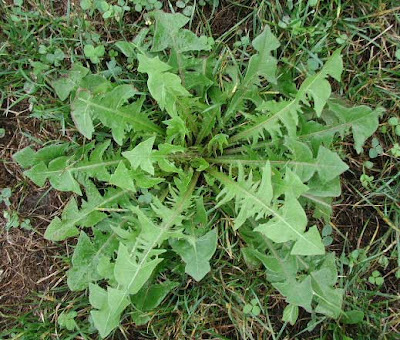 Another weed every lawn owner hates which is better, (much better) in winter is the dandelion. Rather than take a risk of pollutants, gather these herbs where you know someone has not been spraying or away from roadsides. You can also grow your own. I've had the best experience with wild chicory, which has leaves like this but much larger. Chicory and dandelions are closely related to lettuce, but more bitter, a taste Americans have to get used to. Mixed in a salad with milder greens, dandelions are wonderful and full of iron, calcium and other vitamins and minerals. 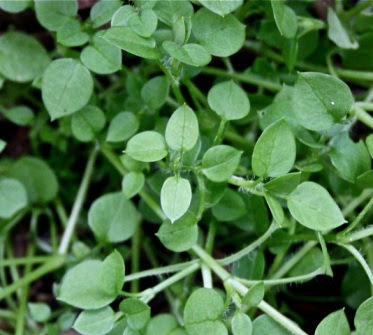 Chickweed is another pernicious weed that is good to eat in winter and rich in Omega 3. The crucifers, the mint family, spinach and the lettuce family are all high in Omega 3. Be aware that Omega 3 will thin the blood. Chickweed does not come in a "nicer" domesticated form, but plant it and gather the small leaves for it is mild, delicious and great in salads. 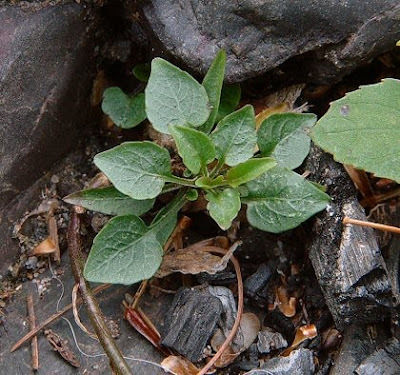 It grows like a weed during the cool, rainy months of the West Coast and well in warmer regions inland. Here is the Western equivalent of Spring Beauty. It is a mild, wonderful green that grows all winter on the Coast and can be grown in boxes or in the open in the milder regions inland. It is in the purslane family, which will let you know (if you know your families) that there are a few hot season relatives to round out your seasonal diet from the garden. 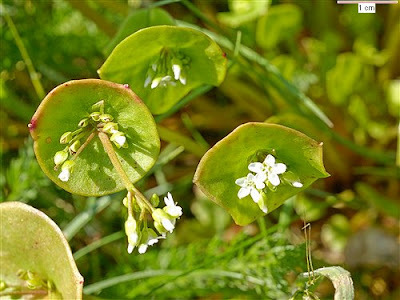 Miner's lettuce, or Claytonia is mild enough to eat out of hand, juicy and very prolific. 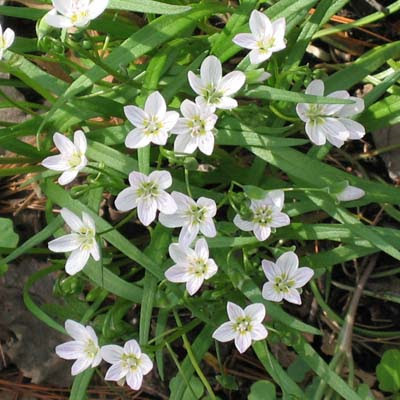 It also re-seeds under the right conditions and grows on damp, acid soil. One of my favorite "weeds" is the plant rapunsel, made famous in the fairy tale. Campanula comes in a hundred varieties, many of which will survive winter. Campanulas and their close relatives Plactycons vary in taste from pungent to very mild. Some go dormant in winter, but many will survive and stay green up through zone 5. Some are very invasive, but others will stay in place and give you lovely flowers in late spring. Still others are grown for their roots, which can be as hot as radishes or very mild. They are largely carefree, grow under all kinds of conditions, and are good eating! There are a number of herbs that do better in winter than in summer, like many of the leaf umbels: dill, parsley, sweet cicely, cilantro; the mints, some of which go dormant, but most of which sprout so early in spring to be winter plants; and all the onion family. Shepard Ogden talks about digging up winter leeks with a flame torch in sub-zero ice. The thing about eating salads is that they are unappealing when it is cold outside. However, if you get used to eating them and do eat them, you will find greens to be very warming right after you eat them. If you like salads in summer, try winter salads, especially if you can grow and experiment with your own greens. Remember that eating them raw means that you must break down the cell walls, either by chewing thoroughly, chopping them very fine, or putting them in juices and smoothies. If you do not care for the taste of chlorophyll, mixing greens with something pungent will mask the taste, or mixing them into pestos will give you the nutrition, but cover the taste with garlic or basil. Excellent article!!! Don't forget nasturtiums! I just started rereading "food for free!" and it reminded me of chickweed, among other things (in the UK)....you would love the little book!